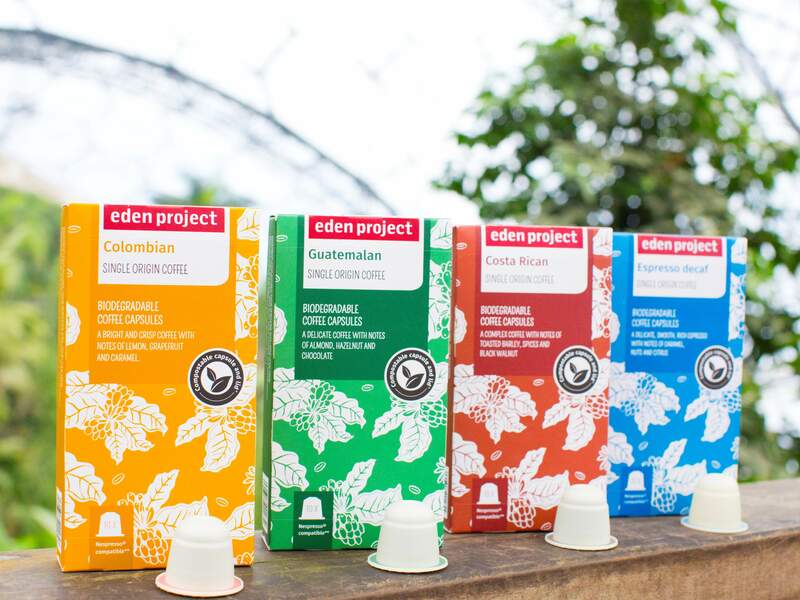 the Eden Project has launched a range of compostable coffee capsules in four varieties. Credit: The Eden Project. Educational charity the Eden Project has launched a range of coffee capsules that break down within weeks in a domestic compost heap or a food recycling bin. The packaging is made from card and the label is printed using vegetable-based inks, which can both be recycled. Standard single-use coffee capsules are usually made with plastic or aluminium with a foil cap. The mixture of materials used in their packaging and the dregs of unused coffee at the bottom makes them hard to process in recycling plants. It has been estimated that it may take up to a century for the capsule to fully break down. The coffee capsules are compatible with Nespresso machines and come from four coffee-producing countries: Colombia, Guatemala, Costa Rica and Italy. The Colombian variety have notes of lemon, grapefruit and caramel, while the Guatemalan product tastes of nuts almond and hazelnut accompanied by chocolate. The Costa Rican coffee capsules are spicy with a hint of toasted barley and walnut and the Italian variety is a rich, decaffeinated espresso with caramel, nut and citrus notes. The Eden Project commercial manager Tracey Smith said: “At Eden we are always searching for sustainable solutions and looking to reduce waste. These fully compostable capsules allow coffee lovers to enjoy delicious ethically-sourced coffees without creating additional plastic waste”. The coffee is available from Waitrose and the Eden Project stores, as well as online from Fresh Coffee Shop, retailing at £4.99 per 200g bag of capsules. The Eden Project is a charity which aims to connect humans with each and the natural world. Its visitor destination in Cornwall, UK, consists of a biome rainforest with a canopy walk, an outdoor garden, a giant bee structure and a biome containing a replica of Mediterranean, South African, Californian and West Australian landscapes.